How many Units (500 ml)? Sea vegetables, like kelp, provide organic iodine, which is crucial as a nutrient when taken internally. These natural sources of iodine are essential for a healthy thyroid. Kelp in particular, with its balance of natural iodine with other minerals, vitamins and trace elements, is considered a body balancer, promoting adrenal, pituitary and thyroid health. The bio-availability of organic iodine in liquid kelp can assist in normalizing thyroid disorders, obesity and lymph system congestion. It detoxifies and eliminates heavy metals and toxins, very effectively helping to purify the blood. Liquid kelp can be used effectively for weight loss by aiding in eliminating excess stores of fat and fluids. Its easily absorbed organic minerals and trace minerals provide energy and stamina, while organic vitamins boost the immune system and act as viral protectors. Seaweed's natural digestive enzymes help the body's metabolic and digestive systems with assimilation. Ocean Wonder, in its liquid concentrate form, is very quickly assimilated, with just an ounce providing the recommended daily dosage. The liquid form is soothing to a sensitive or troubled digestive system, aiding greatly in treating recurrent constipation and gastric bloating. Topically, Ocean Wonder has added benefits, promoting healthier skin, hair and nails. Misting kelp onto the skin helps regenerate and firm skin while protecting against moisture loss. Ocean Wonder is extracted from one of the best species of kelp, Laminaria Digitata, which produces the highest levels of organic iodine and other nutrients, including over 70 vitamins, minerals, amino acids and trace elements. Farmed from the shoreline of Nova Scotia, this kelp is cold water grown, so it has the best nitrogen levels. Lamineria Digitata is an arterial cleansing agent, giving tone to the walls of blood vessels and reducing deposits in the arteries while restoring their elasticity. It also strengthens the circulatory system and helps to lower cholesterol. The kelp plant extracts and assimilates vital minerals from ocean water and miraculously converts then from unavailable inorganic substances to available organic minerals that our bodies can then use for overall health. There is little doubt that this wonder from the sea is one of the most natural, healthy and pleasant ways to add vital nutrients to your daily diet. Ocean Wonder is a 100% natural, iodine-based kelp concentrate. It is a clear, odorless liquid without the traditional fishy after taste of other kelps on the market. Ocean Wonder utilizes industry leading proprietory extraction methods, creating unprecedented product quality and value. 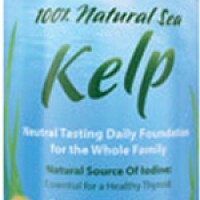 Catch the new wave of health from the sea-help yourself with liquid kelp! Disclaimer : The statements regarding these products have not been evaluated by the Food and Drug Administration, or any other regulatory entity. These products are not intended to diagnose, treat, cure or prevent any disease. The information on this Web site or in emails is designed for educational purposes only. It is not intended to be a substitute for informed medical advice or care. You should not use this information to diagnose or treat any health problems or illnesses without consulting your physician. Please consult a doctor with any questions or concerns you might have regarding your condition. To find a naturopathic doctor in Canada or the United States click on the respective country. Disclaimer #1 : The statements regarding any of the products on this website have not been evaluated by the Food and Drug Administration. These products are not intended to diagnose, treat, cure or prevent any disease. The information on this Web site, in emails, or in newsletters is designed for educational purposes only. It is not intended to be a substitute for informed medical advice or care. You should not use this information to diagnose or treat any health problems or illnesses without consulting your physician or health care practitioner. If you are pregnant, nursing, taking medication, or have a medical condition, consult your physician before using any of these products. Please consult a doctor with any questions or concerns you might have regarding your condition. To find a naturopathic doctor in Canada or the United States click on the respective country. Innotech Nutrition Solutions, Dr. Gerry Bohemier, DC, or Body Charge Nutrition may have authored the presented information in whole or in part and therefore retain and reserve all copyright respectively.